The past two weeks have been a busy – if not tumultuous – period for Intel. 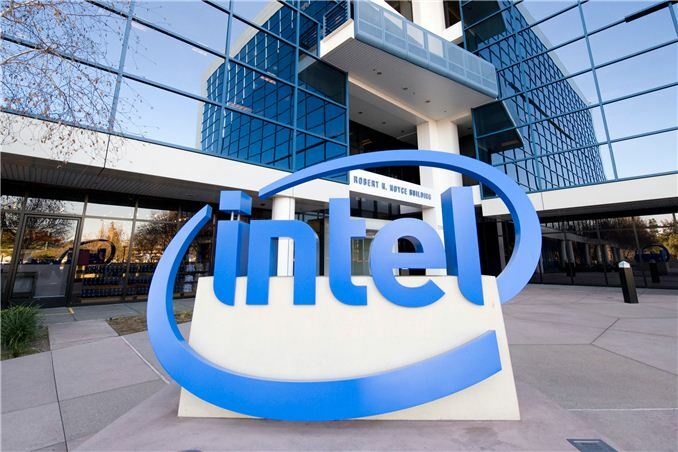 Driven by continued challenges in various semiconductor markets, culminating in weaker-than-desired earnings in the most recent quarter, Intel has set out to change their direction and refocus the company towards what they see as more lucrative, higher growth opportunity markets such as data center/server markets and cellular (5G) connectivity. To get there, the company is making changes to both their product lines and their head count, with the goal in the case of the latter to cut 11% of their workforce by the middle of next year. Today’s big news out of Intel is along these lines, and with strategy and workforce news behind them, we have our first announcements on product changes that will come from Intel’s new strategy. In a report on Intel’s new strategy published by analyst Patrick Moorhead, Moorhead revealed that Intel would be radically changing their smartphone SoC plans, canceling their forthcoming Broxton and SoFIA products and in practice leaving the smartphone market for at least the time being. Given the significance of this news we immediately reached out to Intel to get direct confirmation of the cancelation, and we can now confirm that Intel is indeed canceling both Broxton (smartphone and tablet) and SoFIA as part of their new strategy. This is arguably the biggest change in Intel’s mobile strategy since they first formed it last decade, representing a significant scaling back in their mobile SoC efforts. Intel’s struggles are well-published here, so this isn’t entirely unsurprising, but at the same time this comes relatively shortly before Broxton was set to launch. Otherwise as it relates to Atom itself, Intel's efforts with smaller die size and lower power cores have not ended, but there's clearly going to be a need to reevaluate where Atom fits into Intel's plans in the long run if it's not going to be in phones. For the moment Intel’s announcement leaves some ambiguity in their larger mobile plans – where does the remaining Apollo Lake fit into the picture for tablets, if at all? – but for now we have a very clear picture of the smartphone SoC market, and how Intel will no longer be a part of it. Intel is accelerating its transformation from a PC company to one that powers the cloud and billions of smart, connected computing devices. We will intensify our investments to fuel the virtuous cycle of growth in the data center, IoT, memory and FPGA businesses, and to drive more profitable mobile and PC businesses. Intel delivers a broad range of computing and connectivity technologies that are foundational to this strategy and that position us well to lead the end-to-end transition to 5G. Our connectivity strategy includes increased investment in wired and wireless communications technology for connecting all things, devices and people to the cloud, and to power the communications infrastructure behind it. We re-evaluated projects to better align to this strategy. Update 4/30: After publication, Intel sent along a second message clarifying that Broxton is canceled for both "phones and tablets," as the latter was not mentioned in their original message. Anyone following Intel’s exploits in the smartphone space over the last few years has been watching them with interest on product, timeliness and execution. We’ve interviewed and appeared on video speaking with Aicha Evans, Intel’s current corporate Vice President of the Communication and Devices Group, whose large enthusiasm, energy and mantra of time to market has steered Intel over the past few years into the mobile scene, after bashfully missing an early entry. In that time, Intel has invested many billion dollars in both SoC and modem development to claw a market from the slew of ARM-based solutions in the wild. Aside from having a process node advantage during that time, Intel has had to redevelop its microarchitecture products and radio business into something that could be efficient, performant and price competitive, all the while maintaining the high margins Intel's overall business requires. Particularly in the radio business, the bread and butter of the CVP, Intel acquired and merged several companies to expand its radio portfolio, including the CDMA assets of VIA Telecom announced as recently as Q4 2015, as well as Infineon Wireless (modem/RF) and Silicon Hive (ISP). As admitted by Intel, the first few generations were rough, either resting on their laurels or not having a complete solution. Earlier this decade Intel used a ‘contra-revenue’ strategy, investing into OEMs that would buy their chips, causing operating losses for the mobile division of $3.1 billion in 2013 and $4.2 billion in 2014 with a much lower revenue stream. Intel subsequently combined the financial reports of their mobile and consumer PC businesses into a new Client Computing Division, bringing all CPU/SoC development under a single roof but also obfuscating the investments and losses behind a high performing, high margin part of the company. Thus Intel’s big wins in the smartphone space have been rather limited: they haven't had a win in any particularly premium devices, and long term partners have been deploying mid-range platforms in geo-focused regions. Perhaps the biggest recipient has been ASUS, with the ever popular ZenFone 2 creating headlines when it was announced at $200 with a quad-core Intel Atom, LTE, 4GB of DRAM and a 5.5-inch 1080p display. Though not quite a premium product, the ZenFone 2 was very aggressively priced and earned a lot of attention for both ASUS and Intel over just how many higher-end features were packed into a relatively cheap phone. Meanwhile, just under two years ago, in order to address the lower-end of the market and to more directly compete with aggressive and low-margin ARM SoC vendors, Intel announced the SoFIA program. SoFIA would see Intel partner with the Chinese SoC vendors Rockchip and Spreadtrum, working with them to design cost-competitive SoCs using Atom CPU cores and Intel modems, and then fab those SoCs at third party fabs. SoFIA was a very aggressive and unusual move for Intel that acknowledged that the company could not compete in the low-end SoC space in a traditional, high-margin Intel manner, and that as a result the company needed to try something different. The first phones based on the resulting Atom x3 SoCs launched earlier this year, so while SoFIA has made it to the market it looks like that presence will be short-lived. Overall, Intel’s strategy of ‘Time To Market’ in order to generate revenue in a fast paced market makes sense - if you are late, then you are behind on performance, efficiency, and no-one will buy the chips. However, TTM has drawbacks if the chip comes without the features it needs, and the end result has seen Intel always play catch-up in one form or another, hoping that their strategy would encourage customers. Intel got serious about mobile, but it would appear it hasn't been enough. With Intel announcing the cancelation of their entire suite of smartphone SoCs, this has a significant impact on the company's overall strategy. 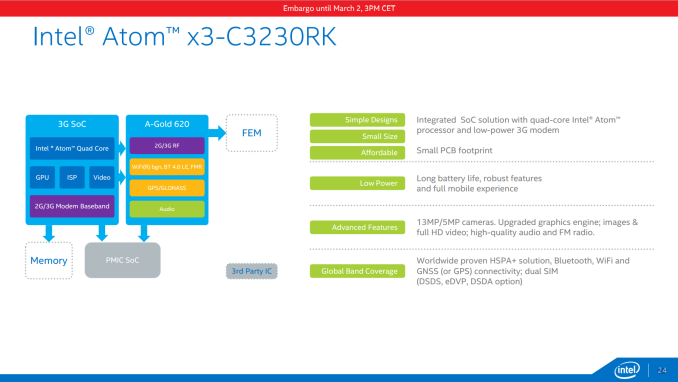 The next generation of Intel's in-house mobile SoCs, Broxton, was lined up to use Intel’s newest generation 14nm Atom core, Goldmont. Goldmont has already been announced at IDF Shenzhen this year as part of the Apollo Lake netbook/low-cost PC platform, but we have been expecting it to arrive as part of a few handsets this year. Despite the fact that we assume Broxton should be in the final stages of silicon development and less than a few months out, the official word from Intel today is that the Broxton commercial platform has been cancelled for both smartphones and tablets, effective immediately. The resources working on the Broxton platform are being moved to areas within the company that offers better returns on investment and are more aligned with Intel’s connectivity (read: 5G) strategy. The other side of this news is the cancellation of the SoFIA 3GX, LTE and LTE2 commercial platforms as well. SoFIA as a platform had missed its original targets, was delayed (some analysts suggest up to a year), and in the end was developed through agreements made with RockChip and Spreadtrum to manufacture some of the SoFIA SoCs for those markets using a less expensive process node but also using the expertise of these two bulk SoC sales companies. We were expecting SoFIA with Intel’s 2nd generation LTE, as well as the next microarchitecture in SoFIA, to be announced this year. As of today’s email exchange with Intel, these programs are now cancelled, again effective immediately. At this point details on how the arrangements with RockChip and Spreadtrum are unclear (Intel declined to comment). Intel’s announcements over the past week have included layoffs of 12000 staff, but also a clarification of Intel’s future strategy. Among those five focal points include the Cloud, the Client business, Memory and FPGAs, R&D through Moore’s Law, and 5G Connectivity. These five areas are all high margin, high grossing and high volume market segments. Sometimes an introspective look and an internal refocus on the core strengths is a good thing, depending on how your competitors are doing, but that means shedding parts of the business that don’t meet those expectations. For the moment at least, Intel is out of the SoC side of the smartphone market. This will allow ARM architecture based SoCs to absorb the remaining market share they didn’t have already. What's less clear at the moment is whether this will also impact the low-cost/non-premium tablet market, as embodied by products such as the Surface 3. In their updated statement, Intel has told us that Broxton is cancelled for both "phones and tablets." Our current understanding is that Broxton is the SoC at the heart of the Willow Trail platform – the successor to the widely used Cherry Trail-T – but at this time Intel has not explicitly confirmed whether this is in fact Willow Trail, or if Broxton's tablet variation represented another platform altogether. Though regardless of what happens with traditional tablets, we'll continue see Intel in more premium tablet-like devices such as 2-in-1s (e.g. Surface Pro) via Apollo Lake and the Core processor lineup, as Intel has previously identified convertable devices as a growth market for the company. Update 5/02: In a newer statement, Intel has confirmed that Apollo Lake will be offered to tablet manufacturers. At this point it's not clear what the tradeoffs are for that versus Willow Trail, and whether Apollo Lake is suitable for all types of devices that the current-generation Cherry Trail has been used in. But this does mean we will see tablets using the Goldmont CPU core, while Intel Intel will flesh out the rest of their tablet SoCs with Core-based parts. Intel will also "continue to support" their tablet customers with Bay Trail, Cherry Trail, and SoFIA parts. 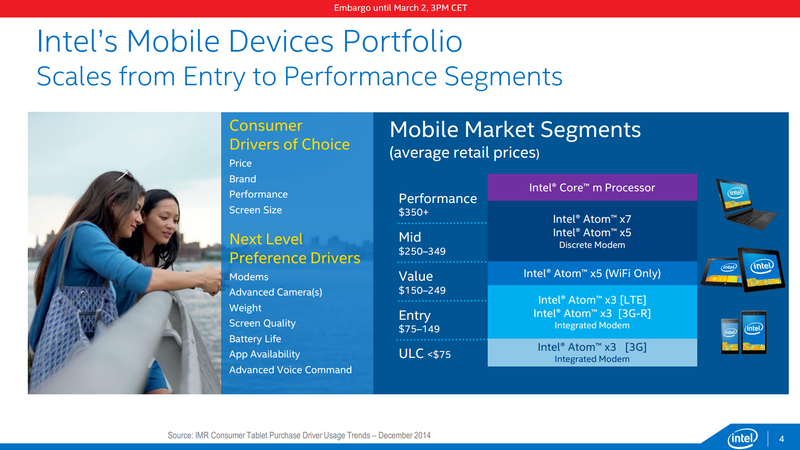 Also not discussed in greater detail is Intel's future plans for their overall Atom lineup. With Apollo Lake announced just earlier this month, it's clear that Intel's Atom efforts have not been cancelled entirely. We will still see the new 14nm Goldmont cores appear in low-cost PCs under Apollo Lake, most likely in several 11-to-13 inch high volume devices. However for the moment there is not an Atom core on Intel's roadmap beyond Goldmont. Finally, despite all of this one key target for Intel will be the rest of the discrete modem market, which is currently Qualcomm’s domain, and the late 2015 acquisition of VIA Telecom’s CMDA assets will help. To put some perspective on this, two things: Intel recently hired Dr. Renduchintala, former Qualcomm VP of Mobile, to head up the client business, as well as Amir Faintuch, also formerly Qualcomm, to co-manage Intel’s Platform Engineering Group. Secondly, at Mobile World Congress 2016 in February, Aicha Evans said that she wanted a big contract in 2016, otherwise we might not see her in 2017. The z3580 was plenty competitive in terms of its contemporaries. It is still faster than most mid to upper range socs. Because they weren't selling the chips at a profit. How much money can they make supplying a chip for a $300 phone? And the 'contra revenue' bit means they were paying someone to use the chips. It was a gamble.